The White Oak River is 48-miles-long and runs through Jones, Onslow and Carteret counties. The river includes saltwater marshes and hardwood swamps that are home to a variety of fish and wildlife. It is used for fishing, swimming, kayaking and boating and has cultural and historical significance. The White Oak River Restoration Plan promotes simple solutions to infiltrate rain and reduce polluted runoff flowing into Dubling Creek, Boathouse Creek, Hills Bay and the waters north of the N.C. 24 bridges in Cedar Point, on the Carteret County side of the river. 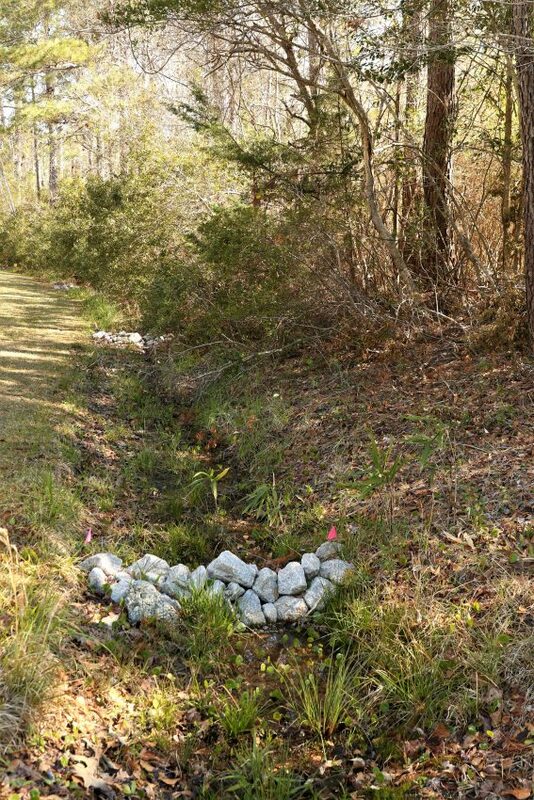 Several simple techniques were installed in 2017 in the Croatan National Forest Recreation Area to help capture rainwater before it has a chance to become polluted stormwater runoff. A rain garden near the boat ramp acts like a bowl to collect polluted rainwater. It soaks up and filters the rain. Earthen berms in the grass swale slow down stormwater runoff and give it a chance to soak into the ground instead of flowing into Boathouse Creek. Check dams (right) made out of rock along the entrance road help slow down water flow. A sloped sidewalk forces rainwater to flow into forested areas instead of the river. Replacement of a culvert so that water flows into forested areas instead of ponding along the road. In 2006, the North Carolina Coastal Federation teamed up with the Town of Cedar Point, the N.C. Department of Transportation, the N.C. Division of Energy, Mineral and Land Resources and community members to prepare a study and restoration plan for a portion of the river. The study found that polluted stormwater runoff from parking lots, driveways, rooftops and other hard surfaces is the primary cause of water quality impairment in the river. About two-thirds of the lower White Oak River is now permanently closed to shellfishing or closes temporarily after a moderate rain. Many dedicated partners including the federation, the U.S. Forest Service, the Town of Cedar Point and East Carolina University worked together to reduce runoff and restore the river. Federation staff worked with Down East Installation to install 25 rain barrels at homes within the Marsh Harbour subdivision. The barrels collect rain so it can be used to water plants and gardens instead of becoming polluted runoff. East Carolina University installed three water control structures in the roadside ditches in the Ocean Spray community. The simple structures hold the rain in the ditch so it has a chance to soak into the ground instead of running into the creek. More than 50 federation volunteers planted a large rain garden at Cedar Point Town Hall with more than 350 native trees, shrubs and perennials. Volunteers included U.S. Navy Hospital Corpsmen from the Marine Corps Base Camp Lejeune. A 3,000-gallon cistern at Cedar Point Town Hall captures runoff from about 75 percent of the town hall roof. The water is reused for landscaping. A 3,000-gallon cistern at the Western Carteret Fire and EMS captures runoff from the roof and is reused to wash vehicles. A 1,500-gallon cistern at Carteret Heating and Cooling captures runoff from the roof and is reused to wash vehicles and to control dust on a gravel parking lot. The federation built a large wetland at the end of a storm ditch in Western Park to reduce polluted runoff into Boathouse Creek. The federation installed small rain gardens in the parking lot of Western Park to capture and infiltrate runoff. Three pet waste receptacles at Western Park were installed to encourage responsible pet waste disposal and prevent stormwater runoff from carrying this source of bacteria into nearby waters. For more information about this watershed restoration plan, please contact Lauren Kolodij at 252-393-8185.